Helicopter work on Vail Mountain (Vail Resorts photo). 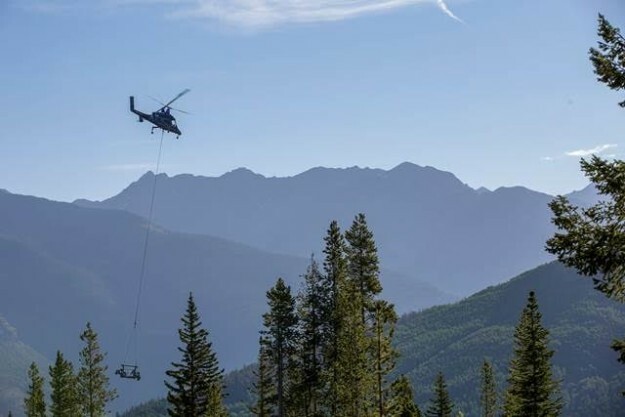 Vail Mountain plans to close Gondola One and Mid-Vail, in addition to various hiking and biking trails, on Wednesday, July 29 for helicopter work that will take place as part of the construction for the new high-speed, six-passenger Avanti Express Lift (#2). During this time all hiking and biking trails between Northwoods and the Avanti area, and within the potential flight path of the helicopter, will be closed for the safety of resort guests. On Thursday, July 30 Gondola One and Mid-Vail are planned to re-open but helicopter work will continue as a part of the construction for the Game Creek zip line tour that’s anticipated to open in summer 2016 as a part of Vail Mountain’s Epic Discovery experience. This work will also affect hiking and biking trails on Vail Mountain. Staff will be in position on Wednesday and Thursday at the base areas in Vail Village and Lionshead, as well as various locations around the mountain, to help with information for guests heading up and down the mountain. The helicopter work being performed is extremely weather dependent and closure dates are subject to change. Vail Mountain will provide updates throughout the week via its @VailMtnAlerts Twitter feed and on its Facebook page. Those planning to access the mountain are encouraged to check one of these sources or call the Vail Mountain Information Center at (970) SKI-VAIL (754-8245) for the most current information. Today at Vail Mountain a helicopter assisted with the construction of the new high-speed, six-passenger Avanti Express Lift (#2). Throughout the course of the day the helicopter helped to remove the old crossarms from the lift towers and flew in 24 new crossarms and sheave assemblies, which were secured to the existing lift towers. Construction of the upper and lower terminals will take place next. The new Avanti Express Lift (#2) will open for the 2015-2016 winter season at Vail, continuing a wave of tremendous investments at the resort. The current lift is being replaced with a detachable six-passenger lift similar to the Mountain Top Express Lift (#4) and will also include a loading conveyor and gates to improve efficiency and increase capacity by up to 30 percent. The Avanti Express Lift (#2) is a primary lift on the front side of Vail Mountain, serving intermediate and advanced terrain and dispersing skiers and snowboarders from Lionshead to mid-mountain. The new lift will reduce wait times and improve skier and snowboarder circulation. The current lift – a Doppelmayr detachable quad – was installed in 1989.